Chipotle: Show your faculty ID when ordering from 3 p.m. to closing for a free burrito when you buy one at participating locations. Cici's Pizza: Bring your faculty ID for a free buffet — drink not included. World of Beer: Get a free free draught pint of either Sam Adams Nitro White or Angry Orchard Crisp Apple Cider with a faculty ID. The web page says the offer's good Tuesday, May 3, but presumably that's a typo since Teacher Appreciation Day is on May 8 (and May 3 doesn't fall on a Tuesday this year). Bruegger's Bagels: Get 20 percent off a catering order for teachers through Friday, May 11. Costco: U.S. teachers who sign up for new memberships online Tuesday get $60 in savings. MOD Pizza:Get 50 percent off your pizza or salad at participating locations with your faculty ID. 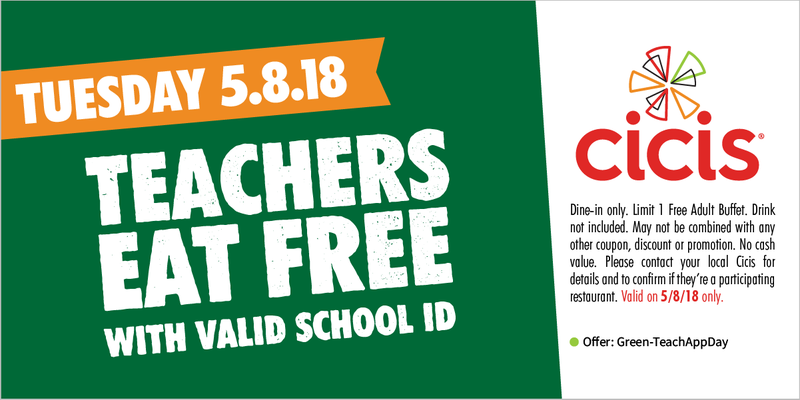 PDQ: Show your faculty ID to get 50 percent off your order. Former teacher Elizabeth Walen describes how a shift in education - away from individualized learning and towards test preparation - made her work as a teacher unpleasant.